This week included two concerts from our 16 year old son Andy who plays viola in several orchestras. On Monday night, it was the Reno Philharmonic Youth Orchestras. We went out for a quick dinner between rehearsal and concert. Stan at the pre concert dinner wearing a sweater I knitted for him about 25 years ago and it finally fits him! Andy used to play in the Youth String Symphonia (YSS) and the conductor, Carol Laube, is one of the biggest Cubs fanatics I know. She goes to training camp each spring and asks her orchestra students Cubs trivia questions at rehearsal. Andy did pretty well on some of those. YSS played first, and of course Carol had to mention the World Series, and she donned her Javier Baez jersey for the last piece. Then Andy’s orchestra, the Youth Concert Orchestra, played and sounded better than last year. His viola teacher is the conductor now and he moved the violas in front of the cellos, because they sounded so good, he said. Then the top orchestra, the Youth Symphony Orchestra played. On Thursday night Andy had his Reno High School Winter Concert. This concert also had three orchestras. Andy played in the third one – the Chamber Orchestra . Their last piece was Christmas Eve – Sarajevo, originally by the Trans Siberian Orchestra (TSO). I only recorded the last few minutes. https://alteringlifespectations.files.wordpress.com/2016/12/christmas-eve-sarajevo.wav Well done, Reno High School Chamber Orchestra! It was beautiful and really struck a chord with me: the beautiful Christmas music and the obvious war sounds of the drums and cymbals. I remember watching the 1984 winter Olympics and seeing the beautiful old buildings in Sarajevo. I also remember the day in 1992 (April 5) that the siege of Sarajevo started. I was a grad student at the University of Nevada and I saw Yugoslavian students glued to the televisions in the student lounge. (This was pre Internet) I could only imagine the fear they had for their loved ones at home. The siege lasted almost 4 years. Vedran Smailovic continued to play on the rubble of the fountain every night. This explains why the musical piece affected me so strongly. It is two-fold. One side is ALS, which is my own body doing the destruction, not some outside invader or natural disaster. And I have to learn to “play music” while the destruction continues within me. The other side is the two guys I live with, who both deal with frustration and anger in a much louder way than I do. Last weekend I told my son he couldn’t depend on me waking him up anymore. Now that I don’t have to get up for work I tend to sleep through my alarm. He managed to get himself up three days in a row. The fourth day he woke us up when he got up and already had missed the bus. He woke Stan just in time to rush out to a 7 am meeting. Andy asked Stan to drive him, but with the appointment he couldn’t. He asked me to drive him but I had meds to grind and take before I could. This meant he would have to ride his bike (which was the prearranged deal if he misses the bus, which works better in the warmer months!). And this meant slamming doors and yelling. Stan had given him a head covering for under his helmet. Andy asked to borrow my winter riding gloves and I told him he already had them somewhere (more anger). I stayed in my room and took my time getting ready to go out to avoid the anger. I did grab my winter running gloves and gave them to him. I started grinding my meds and he came in from the garage and said loudly and angrily, “Where’s the lock?” I shrugged with hands spread apart as in, “I don’t know”. He went back out and obviously found it because he left. I am finding it much easier to not get emotionally involved now that I can’t talk. So I felt like the orchestra playing Christmas music with bombs falling all around. He rode the bus home from school and we picked up his bike after the concert. Stan got very frustrated with our computer and printer when we were printing our Christmas card envelopes. He was talking like a pirate loudly, so I went back to being the orchestra by going to take a shower. This week was tough too because it was the end of visits of family and friends and travel. Back to normal life! Andy and Stan are selling Christmas trees with Andy’s Boy Scout troop. I have helped in previous years, and enjoyed it, but it would not work without talking so it’s all on Stan this year. He is in so much pain, I feel bad that I can’t help out. There is a beautiful You Tube video of Christmas Eve – Sarajevo with a little girl who wakes up on Christmas Eve and opens a trunk and takes out an hour glass. The Trans Siberia Orchestra is playing outside. Images of the years of war cover the screen. Then she goes out among the orchestra and images of the Dayton Peace Accord and celebratory fireworks cover the screen. By the end of the music she is back in the house just before midnight and puts everything away and lays on the couch feigning sleep as her mother checks on her. You can view the video here. I hope some international coalition can force peace in Syria and end the siege of Aleppo . I hope some of the promising treatments for ALS can be approved quickly before it’s too late for many more people. Every 90 minutes someone dies from ALS. There is no time to waste! Meg, Thanks for sharing! It is almost as good as being with you! I understand what you’re saying about the Sarajevo Concert and quiet during a storm of war or yelling, and I support you morally and with love! I watched the little girl video and found it lovely and moving! I’m amazed that you know so many of the references of passing time! 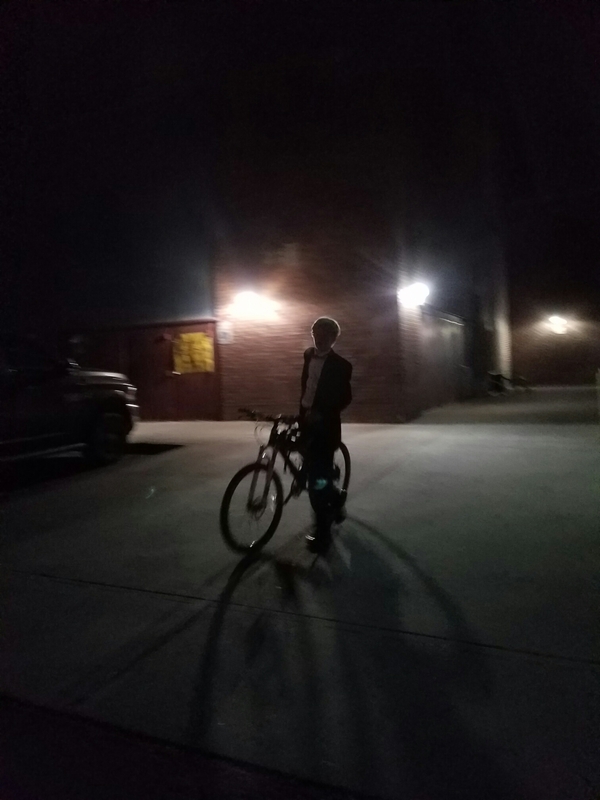 Also, the photo of Andy in his tuxedo picking up his bicycle at night is so poetically evocative when one knows the origins story you told of that morning. It’s all there in the photo, with his apologies too, and knowing how well his parents care for him.